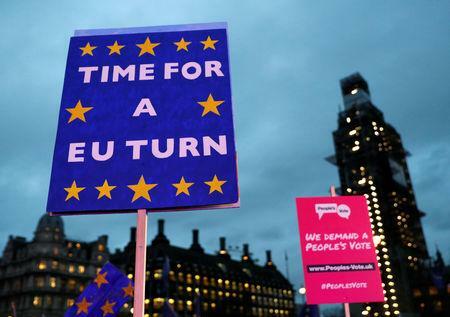 LONDON (Reuters) - European Union leaders said they would step up preparations for a no-deal Brexit and business groups reacted with alarm after British lawmakers defeated Prime Minister Theresa May's Brexit divorce deal by a crushing margin on Tuesday. "It is clear that the House does not support this deal. But tonight's vote tells us nothing about what it does support. Nothing about how - or even if - it intends to honour the decision the British people took in a referendum Parliament decided to hold." "The risk of a disorderly withdrawal of the United Kingdom has increased with this evening's vote." "This is a catastrophic defeat for this government. After two years of failed negotiations, the House of Commons has delivered its verdict on her Brexit deal and that verdict is absolutely decisive." "The Irish Government recalls the clear position of the European Council at its meeting of December 13 when it stated that the withdrawal agreement is not open for renegotiation. "The Irish Government recognises, however, that a disorderly Brexit is a bad outcome for everyone, not least in Northern Ireland. It is not too late to avoid this outcome and we call on the UK to set out how it proposes to resolve this impasse as a matter of urgency." "Every business will feel no deal is hurtling closer. A new plan is needed immediately. This is now a time for our politicians to make history as leaders." 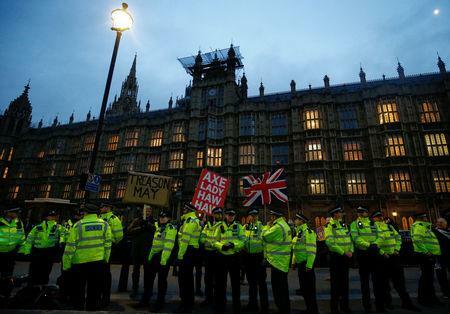 "With today's decision the majority of parliament has done its country a disservice. Now an uncontrolled Brexit is more likely. The consequences of a 'no deal’ would be fatal." "Leaving the EU, our biggest and most important trading partner, without a deal and without a transition period to cushion the blow would put this sector and jobs at immediate risk." "Time is running out to avoid a chaotic 'no deal' Brexit that would be catastrophic for the UK economy. "Firms in the finance industry have put contingency plans in place to minimise disruption for their customers in a 'no deal' scenario but critical cliff-edge risks remain, including on the transfer of personal data and the operation of cross-border contracts." "Parliament's pantomime now continues while business suffers impossible uncertainty which will only worsen investment and the worrying business climate." "It is the collective failure of our political leaders that, with only a few weeks to go, we are staring down the barrel of no deal." "As things stand, UK law says we will leave on 29th March, with or without a withdrawal agreement, and yet MPs are behaving as though they have all the time in the world – how are businesses meant to prepare in this fog of confusion?" 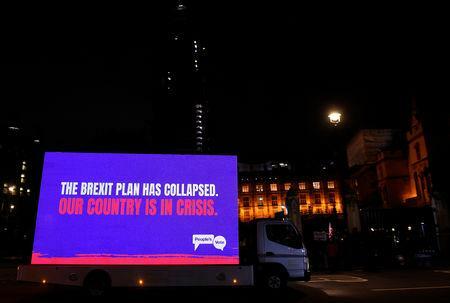 "There are no more words to describe the frustration, impatience, and growing anger amongst business after two and a half years on a high-stakes political rollercoaster ride that shows no sign of stopping." Sterling rebounded smartly from the day's lows and rallied more than a cent to stand above $1.28 after British lawmakers defeated Prime Minister Theresa May's Brexit divorce deal by a crushing margin on Tuesday. "UK assets will continue to be vulnerable to the political volatility and we don't expect this will subside until a concrete conclusion emerges." "We do not advocate investors take directional views on sterling, gilts or UK stocks while this clarity void remains so large. Within existing portfolios, investors would be wise to limit any UK exposure at benchmark levels." "After tonight's emphatic rejection, small tweaks won't get the deal over the line." "Conversely, 'no deal' is not supported by the PM, and Parliament will do everything to prevent it. The probability of Article 50 extension is now very high, and the stock of Article 50 revocation is rising too."